Ammonia is the most basic part of the nitrogen cycle and can make or break any aquarium. It is the first thing you test for when starting a new tank. 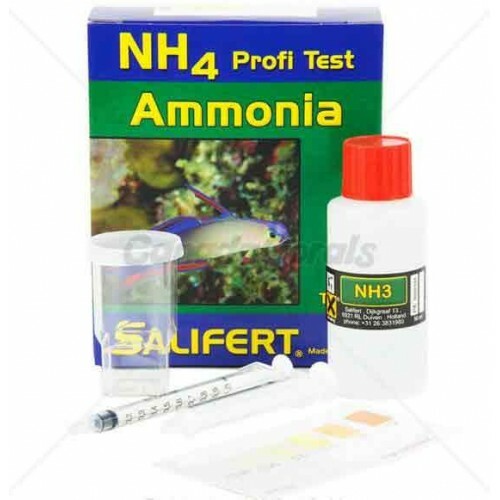 When testing for ammonia it can give you a good idea if you are going through a cycle or if you are developing a problem with in your aquarium. Ammonia and ammonium should be rapidly converted by aerobic nitrification into nitrite and then nitrate and finally into nitrogen gas. If this does not happen then either the aquarium is not fully matured or there is a problem with the tank`s biological system, which can be caused by an excessive biological loading being placed on the system. The Salifert Ammonia Test Kit measures the total amount of ammonia and ammonium quickly and accurately. Sufficient for up to 50 tests and can detect 0.5 ppm of total ammonia easily. Add with 5ml syringe 1 ml of water in the test vial. Add 6 drops of NH3-1 (watch out caustic!) and swirl gently for 5 seconds. Add 6 drops of NH3-2 (watch out contains Mercury salts, wash hands after use, keep away from food, see additional warning under the heading WARNING). Swirl gently for 5 seconds and allow to-stand for 5 minutes. Hold the test vial and look through the side of the test vial. Keep the color chart behind the test vial. Ensure that a white piece of the color chart is behind the liquid layer. The values on the color chart are in mg/L total ammonia (that is NH3 + NH4+). KEEP OUT OF REACH OF CHILDREN. NH3-2 contains mercury salts. If ingested seek immediate medical advice. Keep away from food and feed. Wash hands after using the NH3-2 reagent. Remove any spilled NH3-2 immediately with a tissue and afterwards with water. If NH3-1 (is caustic) comes into contact with the eyes rinse immediately with plenty of water and seek immediately medical advice. If ingested seek immediate medical advice. If any of the reagent comes in contact with the skin rinse immediately with plenty of water.